Established in 2002, the web portal MuslimHeritage.com was the first major project of FSTC’s not for profit organisation. Now managed by FSTC as a charitable project, it is a unique online education community of scholars seeking to advance human civilisation through the study of Muslim heritage. A journey to the past, to build and design a better future! 1001 Inventions is a UK based not-for-profit educational organisation that creates award-winning blockbuster exhibitions, films, live shows, productions and educational materials. 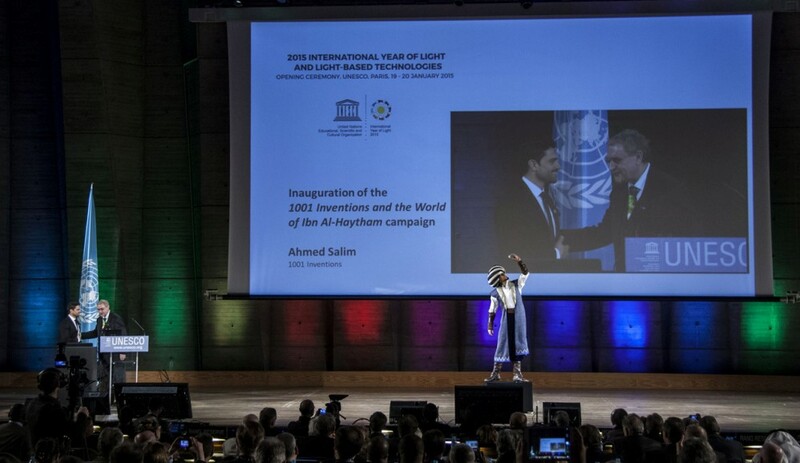 In January 2015, UNESCO and 1001 Inventions launched the “1001 Inventions and the World of Ibn Al-Haytham” global educational campaign to celebrate the International Year of Light and Light-based Technologies (IYL2015) and the scientific legacy of the remarkable 11th century scientist Al-Hasan Ibn al-Haytham. FSTC are dedicated to helping schools and colleges, parents and young people discover their shared dynamic heritages in this global and interdependent age. It has an educational outreach to enrich school curricula in order to highlight the shared cultural and scientific inheritance of humanity. As well as continuing with large-scale initiatives, FSTC conducts outreach activities through conferences, festivals and lectures, as both host and guest. FSTC has organised small exhibitions at the UK Houses of Parliament, the EU Parliament and the United Nations in New York.